We live at the bottom of an ocean of air — 5,200 million million tons, to be exact. It sounds like a lot, but Earth’s atmosphere is smeared onto its surface in an alarmingly thin layer — 99 percent contained within eighteen miles. Yet within this fragile margin lies a magnificent realm — at once gorgeous, terrifying, capricious, and elusive. With his keen eye for identifying and uniting seemingly unrelated events, Chris Dewdney reveals to us the invisible rivers in the sky that affect how our weather works and the structure of clouds and storms and seasons, the rollercoaster of climate. Dewdney details the history of weather forecasting and introduces us to the eccentric and determined pioneers of science and observation whose efforts gave us the understanding of weather we have today. 18 Miles is a kaleidoscopic and fact-filled journey that uncovers our obsession with the atmosphere and weather — as both evocative metaphor and physical reality. From the roaring winds of Katrina to Palladio’s architectural triumph, La Rotonda, Dewdney entertains as he gives readers a long overdue look at the very air we breathe. I enjoyed this book. 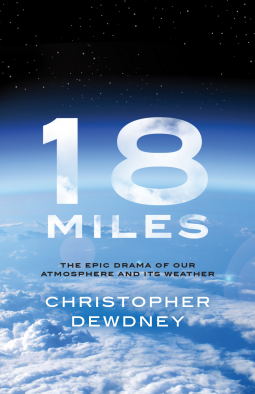 Christopher Dewdney wrote a fascinating and accessible book about Earth’s atmosphere and weather, including a fair amount of history. He uses a conversational tone but with what I felt to be some haughtiness, but this didn’t significantly affect my enjoyment of the book. I found this book to be much better than Windswept by Marq de Villiers. I recommend Dewdney’s effort for anyone interested in science.